It’s time for what is perhaps the biggest social event on the Japanese calendar - hanami, or the annual viewing of cherry blossoms. As beautiful as these flowers are, their fragility symbolizes the fleetingness of life as they remain for just one week after peak bloom. But you don’t need to let spring pass you by! To help you set the mood and celebrate the season in style, we have found 20 of our favorite Japanese things that you can buy on Amazon, all featuring gorgeous cherry blossom designs. From sakura tea, to cozy loungewear; decorative stationery to stunning lacquerware; find the perfect spring gift for yourself here! Furoshiki, traditional, eco-friendly wrapping cloths that can be used for lunch boxes and gifts are timeless mini-tapestries that will never go out of style. The artwork and motifs of a furoshiki, such as this item featuring a cat on a bridge underneath a flowering cherry tree, are inspired by scenes and patterns in nature. When not in use, a furoshiki is a wonderful accent to a table or can even be framed and hung. There’s no need to feel wary about online shopping for clothing when it comes this 100% cotton jinbei decorated tastefully in a cherry blossoms design. 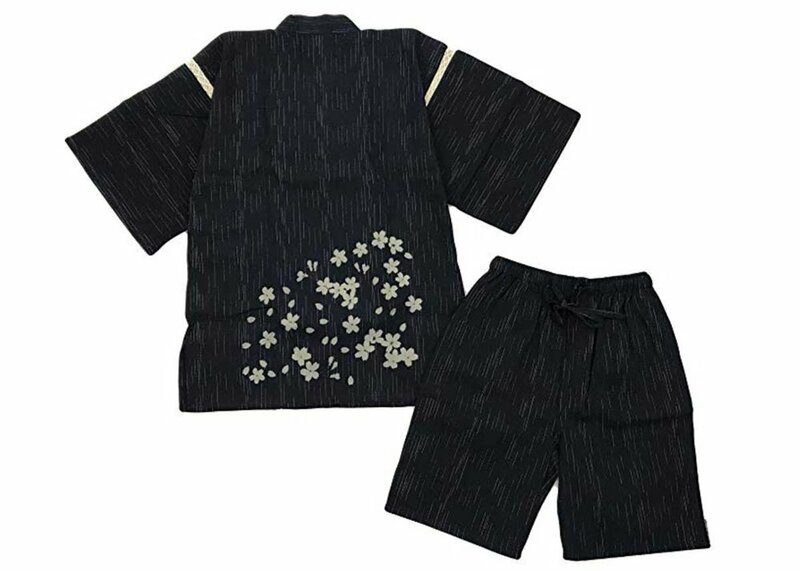 Jinbei are lightweight garments typically worn during humid Japanese summers, but this set is suitable for lounging around the house or even when you’re out running a few errands in warmer climates and temperatures. The drawstring waistband bottoms and wrap-style top comes in a range of sizes that accommodates larger and taller frames, too. For a classic look, go for Sakura Black, but if you really want to spread spring cheer, opt for the large print Sakura Big Navy. Kanzashi are traditional hair ornaments worn by geisha, maiko, and brides. Give yourself a modern-day makeover by pairing them with your favorite clothing. Easily transform your go-to jeans and a nice top outfit by accessorizing with this adorable and dainty hairstick that adds a charming feminine touch to any casual hairstyle or updo. The cluster of three acrylic cherry blossoms, each measuring just over an inch across, is accented with pearl beads and comes in a drawstring pouch for storage. 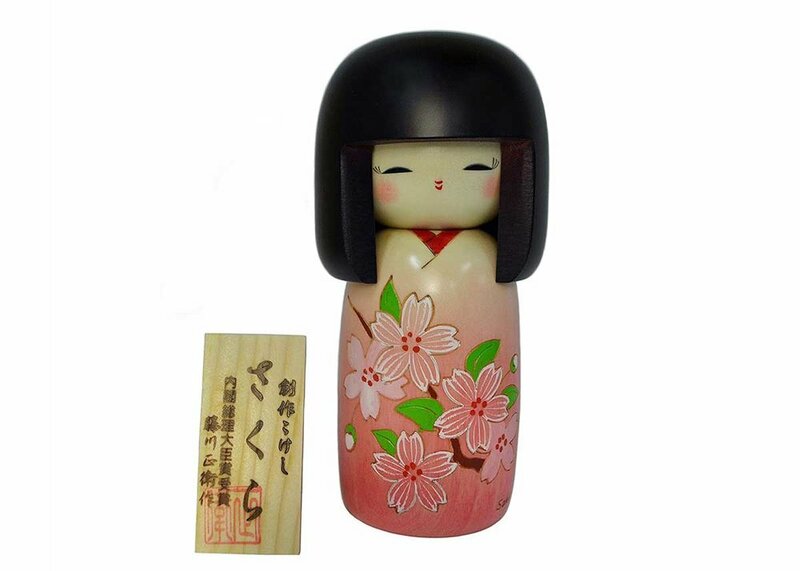 Kokeshi, a traditional type of doll handcrafted from dogwood, are synonymous with Japan’s northern Tohoku region. However, Gunma Prefecture is eastern Japan’s largest production site of sosaku (original) kokeshi. The dolls from Usaburo Kokeshi all boast creative designs and motifs. This particular maiden is decked out in sakuta spirit in this fine spring kimono. Note how the beautiful wood grain faintly appears below the surface of the paint, another trait of Usaburo Kokeshi dolls. Make mealtime a festive occasion every night with this dishwasher-safe sushi dinner set with an understated cherry blossom design. Consisting of two dinner plates, two dipping saucers, and two pairs of dark wooden chopsticks, the sakura motif in the lower corner of the porcelain dishes contrasts sharply with the deep cobalt and earthy tones. Each cherry blossom is painted in great detail, down to the veins of the petals and the coloring of the leaves. 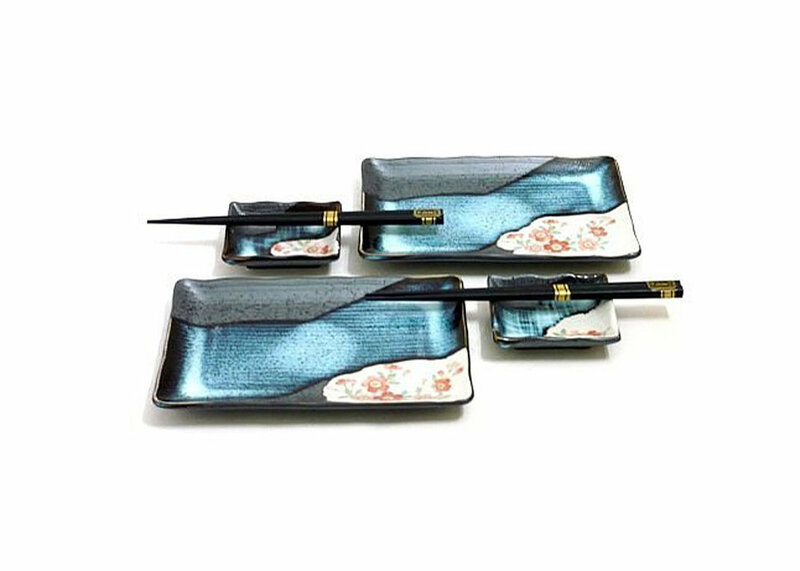 This sushi set would be an excellent birthday, housewarming or wedding gift as well. The most popular way to enjoy the cherry blossoms in Japan is sitting atop a blue tarp spread out underneath a sakura tree and sharing snacks, food, and drinks with a group of friends or coworkers. 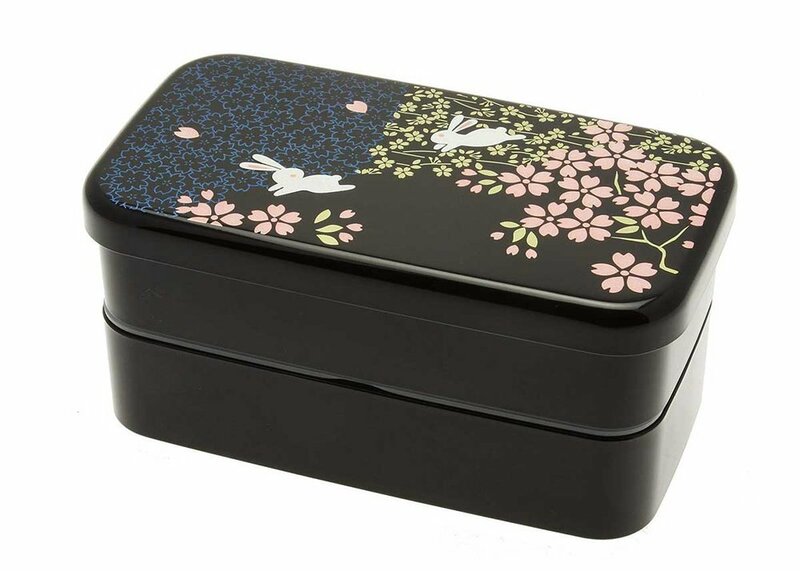 If seasonal allergies prevent you from enjoying the annual bloom of cherry blossoms, recreate the feeling at the office or at school with this cherry blossom and glitter rabbit design two-tiered lunch box. Dishwasher safe and leakproof, pair this bento box with cherry blossom print chopsticks and a cherry blossom design furoshiki to elevate the mood! Cute and practical, this pastel pink kinchaku pouch features two symbols of spring - rabbits and cherry blossoms - and is accented with a golden drawstring tied in a double knot to prevent fraying. It’s common to transport lunch inside a drawstring pouch like this one, but why not also use it to store cosmetics and toiletries when traveling or as an alternative to a clutch? No doubt a kinchaku pouch compliments a summer yukata, but it also serves as a lovely accent to any spring outfit. Just how much is the cherry blossom tree revered in Japan? Not only is hanami an annual pastime, the delicate flowers of the cherry blossom tree are so loved that they make their way in to confectionaries, syrups, jellies, and teas. Experiment with your own creations by using these pickled cherry blossoms. To make cherry blossom tea, simply add one or two blossoms to hot water and enjoy the salty-sour harmony and subtle cherry blossom fragrance. Beautifully detailed with various shades of pink and adorned with glitter, this pop-up greeting card evokes the feeling of a spring stroll underneath a tunnel of cascading cherry blossom trees. Constructed from sturdy stock, this greeting card has a built-in base so you can prop it up on display. A message space is provided on the back to express your sentiments and perhaps even an invitation to see the cherry blossom trees in person next spring! Gather your thoughts with a notebook that will inspire you every time you open its pages. Sweet and delicate cherry blossom drawings in soft tones adorn the front and back cover, as well as the pages within. 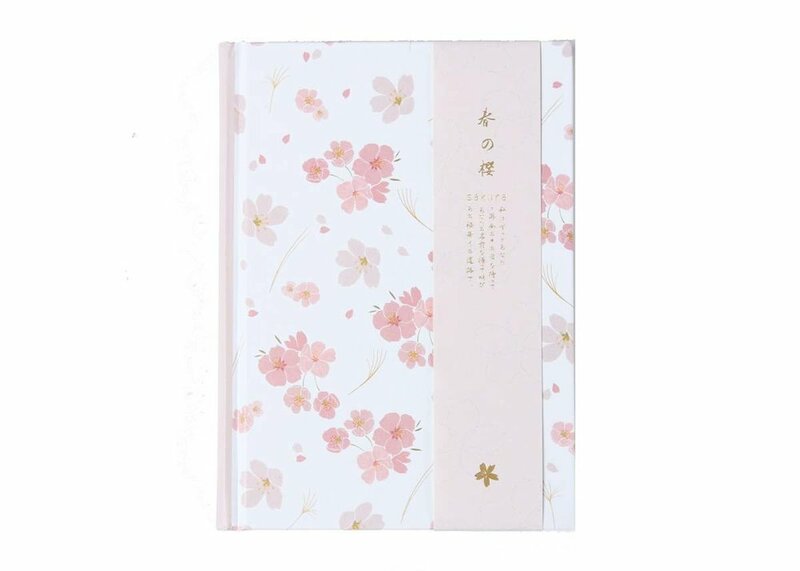 Available in four lighthearted spring colors, this haru no sakura (spring cherry blossoms) notebook is A5 size and features several styles of thick paper ideal for monthly planning, writing lists and memos, and doodling. No matter which color you choose, this notebook is a wonderful way to keep spring within your fingertips. Luxurious and dignified, this Lady White two-toned brass sakura pen from Pilot is tastefully decorated with subtle off-white cherry blossoms that evoke the warmth of a mother’s love. Channel creativity with each stroke from the 14K gold nib that provides an elegant writing experience. Ideal for gifting, the Pilot Lady White pen comes in a gift box that includes a converter, one ink cartridge, and a sleek white pouch made from genuine leather. Perfect for DIY projects, crafting and scrapbooking, washi tape is reusable, biodegradable, and perhaps most important of all, it does not leave any sticky residue behind. The watercolor effect of these three rolls of washi tape make each roll look as if they are decorated with pressed and dried cherry blossom flowers and petals. Add this washi tape roll set to your craft box and you’ll soon understand why everyone raves so much about this magical tape from Japan. When it comes to self-care, you can’t go wrong with Japanese beauty products, which draw upon the country's rich natural resources for inspiration. These paraben-free fragrance sheet masks from Mitomo feature the captivating artwork from woodblock print artist Utamaro (Three Beauties of the Present Day), along with the luxury of gold and blissful essence of cherry blossoms. The resulting formula is one that brighten skins, increases elasticity, and moisturizes for a soothing facial. For best results, leave on skin for 20-30 minutes. What better way to cast off the troubles a stressful day than with a long soak in a soft pink bath? 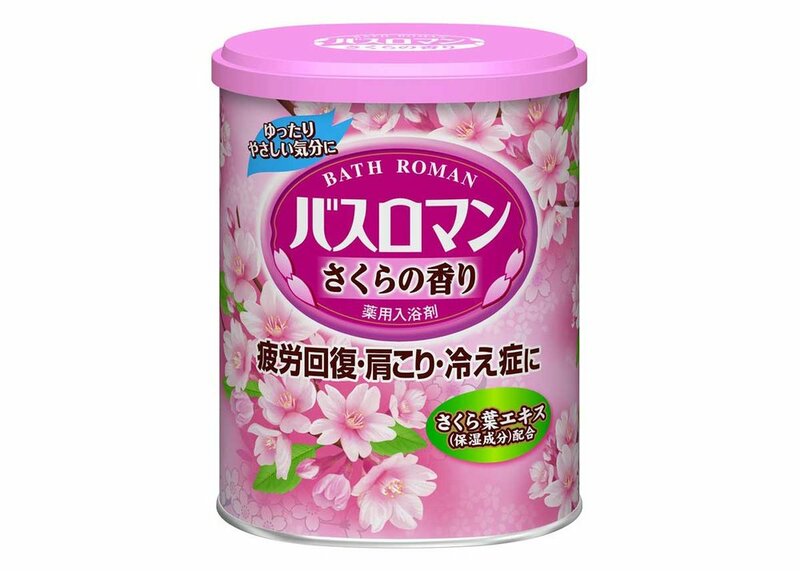 Sweet and flowery, these cherry blossom scented bath salts are sure to bring a smile to your face as you forget about the displeasure you’ve faced. Cherry blossom extract will leave your skin feeling silky smooth while the floral scent will instantly lift your spirits and refresh your mind. Spring may be just around the corner, but winter’s chill still persists. Cosy up with a hot cup of your favorite tea made in this lovey pink tetsubin teapot. The bright, cheery color and faint gold cherry blossom clusters is a charming contrast to the heaviness of the cast iron teapot, which are often found in understated colors like black with rough, bumpy exteriors. Made from a Japanese company with more than 100 years of history crafting tetsubin, each teapot comes with a removable stainless steel mesh and a coated interior to prevent rusting. Handcrafted and painted in Japan, this ceramic matcha bowl is the ideal size and weight for a serving of tea. The interior features a single cherry blossom that appears to flutter mid-air when the bowl is raised to the lips for drinking. 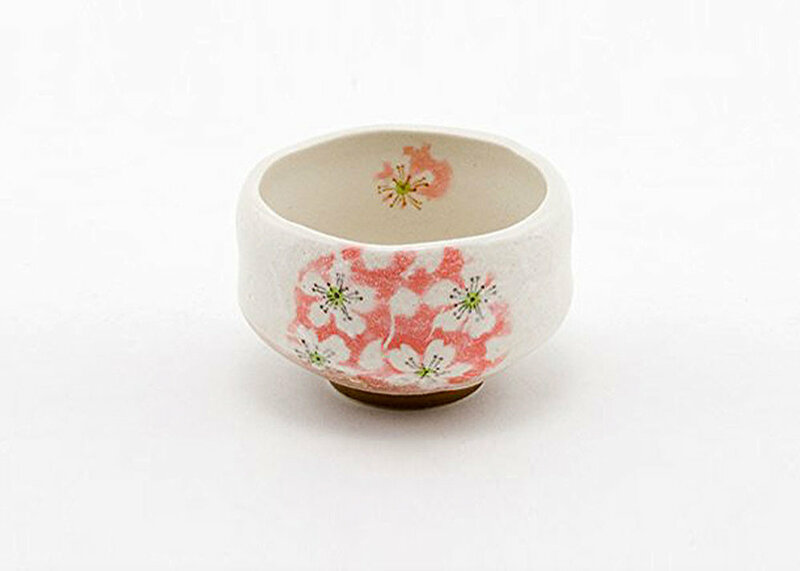 A cluster of realistic cherry blossoms gather against a splash of vivid pink on the exterior of this glazed bowl. When preparing matcha during a tea ceremony, present the floral design to the recipient and face it outward when drinking. A tiered box that is frequently seen during the Japanese New Year to showcase osechi dishes, this jubako can be used to transport and show off sandwiches, rice balls, and cherry blossom infused sweets and baked goods during a hanami gathering. Be sure to wrap with a matching cherry blossom print furoshiki for an ‘authentic’ presentation! Alternatively, use this elegant black and red lacquer jubako to store jewelry and other personal keepsakes in an eye-catching accent that compliments your vanity table. Do your part for the environment and say no to disposible utensils, all while showing off your love for spring with this set of chopsticks and matching carrying case in a cherry blossom design. Keep a set in your purse or backpack so you’ll never have to frantically search for a fork or spoon when bringing lunch to school or the office. Textured grips on the tip allow for easy pickup of smaller pieces of food and slippery dishes like noodles. Fast drying and absorbent, tenugui are a great addition to any bathroom or kitchen, and are wonderfully convenient to have on hand when traveling or using public restrooms. Made to withstand continuous use and to prevent fraying at the ends, this particular design features cherry blossoms in full bloom gently cascading down a flowing river. Whether you choose to use this 100% cotton tenugui as a table runner, tea towel, or decoration in the guest bathroom, you will always have spring within your reach! Add your own twist on the socks and sandals trend by pairing these funky pink split toe (tabi) socks with open toe shoes. If you’re not yet ready to make such a bold fashion statement, coyly show your appreciation for spring’s most celebrated flower by letting them peek from the hem of your jeans. Regardless of how you choose to style these socks, there’s no doubt you’ll have a touch of spring in every step you take with gorgeous cherry blossom fabric gracing your feet!